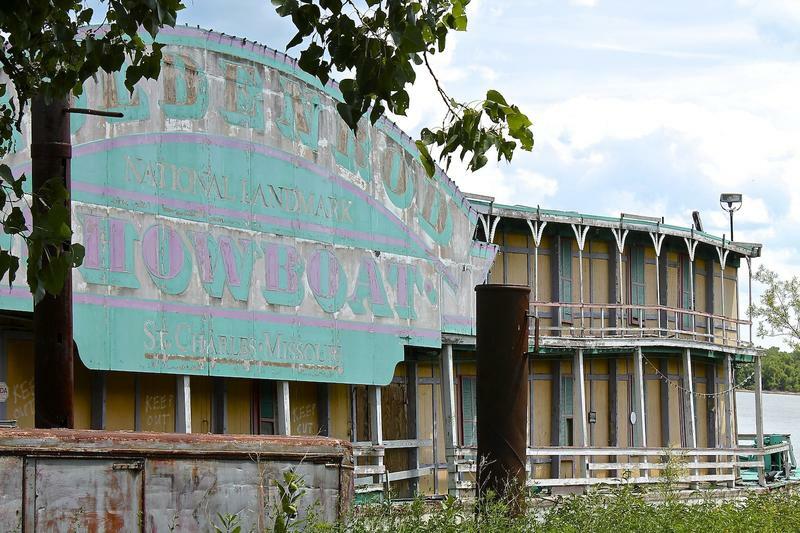 The historic Goldenrod Showboat is currently docked near Kampsville, Ill.
A volunteer group says it’s making slow but steady progress in its effort to restore the historic Goldenrod Showboat for an eventual return to the St. Louis riverfront. Jake Medford, vice president of the nonprofit Historic Riverboat Preservation Association, says the showboat’s current owners recently agreed to a sales price of $225,000. That price includes the boat and riverfront acreage near Kampsville, Ill., where the Goldenrod is currently docked. Fundraising efforts continue, but so far, the preservation group has paid about $13,000 toward the purchase price and has taken over maintenance responsibilities and the cost of insuring the vessel. The showboat, which was designated a National Historic Landmark in 1967, is moored in a remote spot along the Illinois River. The dock owners had threatened to sell the showboat for salvage, but Medford says they have been willing to work with the preservation group. Medford says this deal would provide a safe harbor for the Goldenrod, while his group continues to hold fundraisers and look for grants or angel investors. The showboat will need repairs costing several millions of dollars before it could be returned to St. Louis. The Goldenrod is believed to be one of the last of the floating theaters that delivered entertainment to Mississippi River towns in the early 20th century. After her traveling days ended in 1937, the Goldenrod was moored for 50 years on the St. Louis riverfront, where it was a popular venue for live theater and ragtime music. The showboat has been dark since 2001 -- after a 12-year run as a dinner theater on the St. Charles riverfront. In recent years, the showboat been “in storage” at this riverbank in Calhoun County, about 80 miles from St. Louis. Medford credits a growing number of volunteers who have joined the efforts to save the Goldenrod. “We have a caretaker team, a fundraising committee and board of directors. An advisory board and research team are forming,’’ he said. Like Medford, who is 23, many of the volunteers who have “adopted” the Goldenrod are in their 20s -- too young to have seen the old showboat in operation. Medford, who is from Jerseyville, Ill., didn’t even know what the Goldenrod was when he first saw it moored along a weedy riverbank in Calhoun County several years ago. Medford says the preservationists face a formidable challenge, but they have already come further than some had predicted. Can This Floating Landmark From St. Louis’ Riverfront Be Saved? When: 6:30 p.m., March 21. Where: Left Loft (second floor), 1817 Cherokee St., St. Louis. What: Benefit sponsored by the Historic Riverboat Preservation Association, which is working to save and restore the Goldenrod Showboat. Admission includes appetizers, open bar and entertainment: a melodrama, plus music by The Mound City Slickers and The Get Off My Land Band. How Much: $40 a person; $75 for two. Reservations: RSVP by March 1. Call 314-735-5340 or email betsyburnettbelanger@yahoo.com. Tickets can also be purchased through the Goldenrod’s website.